With over 600 stunning, full-color photographs of over 500 species of butterflies and moths, this is the most beautiful and clear guide to the identification of these fantastic flying insects. Even an amateur enthusiast will be able to spot different species like an expert entomologist. Each entry combines a precise description of the featured butterfly or moth species with annotated photographs to show its chief characteristics and distinguishing features, from ingenious camouflage to signature eyespots to distinctive larval forms and cocoon structures. It is accompanied by a map of the animal's geographical range, as well as color-coded bands with at-a-glance facts specific to the species. In addition to the species-by-species guide, the book contains a fascinating overview of this whole unique order of insects, from the habitats and plants they rely on to survive in the wild, to the details of their distinctive metamorphosis, to the ways ordinary people can distinguish between these similar-looking creatures. 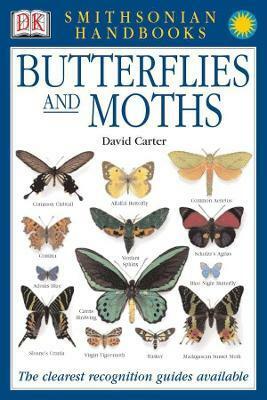 The book is published by Dorling Kindersley in association with the eminently authoritative Smithsonian Institution, and is written by David Carter, who works at the Natural History Museum, London, and has been specializing in moths and butterflies for nearly four decades. It is designed to appeal to beginners and established enthusiasts alike.